Collecting website feedback from team & clients just got easier! What most of our users say makes Marker.io so special are the deep integrations that we support with the best project management and issue tracking tools out there: Trello, Jira, GitHub, Asana, Bitbucket and Slack. But as much as you love those deep integrations, we kept hearing about the same challenges around wanting more flexibility in the way you collect feedback from different project stakeholders. "I'm a product owner at a SaaS company and I'd like my customer support team to submit new tickets into Jira through Marker.io but I don't want them to have access to all of my existing Jira projects. How can I show them only one specific project?" "I'm a project manager at an agency and I want to collect client feedback directly into Trello but my client doesn't have a Trello account he can use with Marker.io. How can I share my Trello account with him?" "I'm a front-end engineer and I want our marketing team to log new website issues into GitHub using Marker.io because they always complain about how unfriendly the GitHub interface is. How can I get them to do that with little set up on their part?" If any of those statements resonate with you, keep reading! Today we're excited to announce "Destinations"! But what exactly is a Destination? Think of a destination as an existing place where you centralize bug reports and feedback. It can be a Trello board, a Jira project, a GitHub repository, a Slack channel or an Asana project. In the past, every new person who was invited to report feedback through Marker.io had to connect his or her own personal accounts from your project management tool. 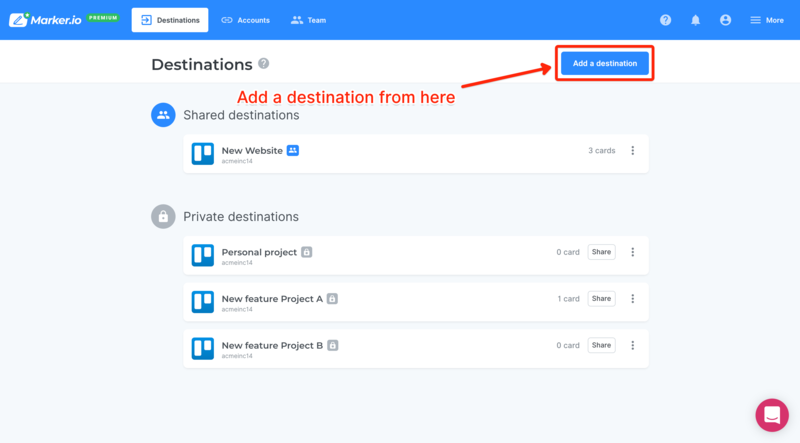 But thanks to Shared Destinations, you can now share a destination with your team and have them report feedback into your existing projects that you picked for them, without them needing to connect anything. Collecting feedback into a new destination only takes a few clicks. You can add it from inside the Marker.io editor (after capturing a screenshot). Or you can add a new destination for your Marker.io admin. In both cases, you will be able to select your connected account, find your existing project and add the destination to your Marker.io team. Once your destination is shared, make sure to invite your colleagues and clients from your admin. Next time your teammates will capture a screenshot through Marker.io, the shared destination will be pre-selected for them. At this point, your colleagues and clients will be able to report feedback into your shared destination. But if you want to go a step further and let all your team members add new destinations themselves using your connected accounts, you can even share your entire Trello, Jira, GitHub accounts without the need to share login credentials. 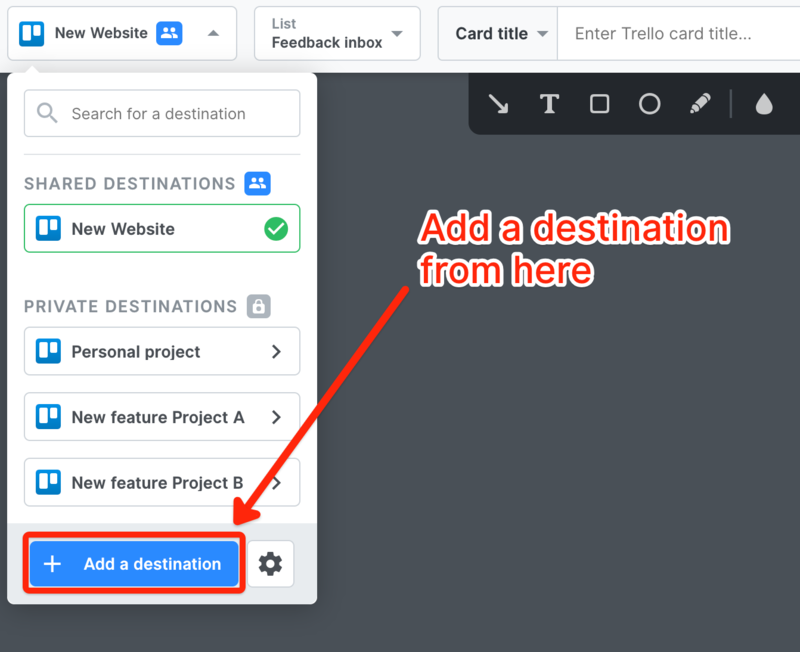 If getting your team members and clients to report feedback to you in a way that's easy for them and actionable for you has always been a challenge, try our new Shared Destination feature now! SHARE A NEW DESTINATION NOW! Let us know what you think in the comments section below 👇!